THE first Act of “Sergeant Brue” (Mr. Owen Hall’s new musical farce at the Strand Theatre) goes with a rattle from beginning to end. The dialogue is full of point, and Mr. Willie Edouin does wonders as the sergeant of police who comes unexpectedly into £10,000 a year. The plot is simple but ingenious. An easy-going sergeant of police, whose “speciality is traffic,” is left £10,000 a year by his brother on condition that he stays in the force until he becomes an inspector. After a variety of adventures he arrests an eminent magistrate for gambling, and receives promotion as the price of his silence, marries the lady for whose sake he used to divert the traffic of Piccadilly up Berkeley Square when she wished to cross the road, and—presumably—lives happily ever after. 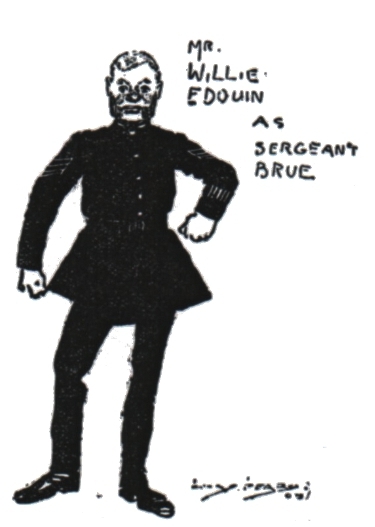 The acting of Mr. Willie Edouin could not have been improved upon. As the Americans say, he was IT. He made more of the simple phrase, “£10,000 a year” than one could have believed possible. Mr. Arthur Williams gave another of his fine character-studies as Crooky Scrubbs—a thief. Mr. Porteous, as the humorous magistrate of Crawlborough Street Police Court, was as funny as Mr. Plowden. Miss Zena Dare, Miss Ethel Irving, Miss Oliver Morrell, and Miss Hilda Trevelyan were all excellent—especially Miss Dare, who is going to do big things in the future, if she fulfils the promise of this performance. The lyrics are smooth, but for the most part pointless. The music, as might be expected from such a composer as Madame Lehmann, is considerably better than most musical comedy music. The opening chorus of the first Act was particularly lively and a sentimental number sung by Mr. Barraclough, and Miss Irving’s song in Act I. were also to the taste of the audience. A GREAT many people would like to know what it is about the stage that frightens Mr. Max Pemberton. His play does not show anything like the grip, the comprehension of essential qualities that his novels display. Let me hasten to add that I enjoyed “The Finishing School” very much. There is a daintiness, and Dresden china-ness about it all which is very restful, and it does not make any great demands upon your mental capacity. You can foresee exactly what is going to happen all along. It only remains to see in what garb the end will come. If, instead of making “The Finishing School” a play, he had made it a comic opera, I think we might have hailed Mr. Pemberton as a force to be reckoned with; and if, in addition, he had got Madame Liza Lehmann to write the music for it, the result would have been far more satisfactory. The story of “The Finishing School” is very simple. A young couple—Dorothy Melville and Murray Vane—run away to Gretna Green to get married. They are pursued by the bluff Sir John, Murray’s father (who is incidentally Dorothy’s guardian), and the wedding is frustrated. Murray is sent to rejoin his regiment and Dorothy is packed off to school for another year. Voila Act I. Act II. shows us Dorothy at school 364 days later. Enter to her a devoted but disinterested admirer, who tells her that Murray’s regiment is ordered abroad, and if she is to see him at all it must be that night. There is a ball at the barracks; she can go as the admirer’s boy cousin from Paris. The ball-room scene of Act III. is infinitely better than the rest of the play. Here we have Dorothy in boy’s clothes, and with a delightful French accent, ruffling it on the strength of her reputation as a duellist. And we see her also wheedling from Sir John, ignorant, of course, of her identity, the secret which will ultimately force his consent to her marriage with Murray. All ends well, of course. Sir John gets to hear that Dorothy is among the guests at the ball and sets out to look for her. She flies back to school on Murray’s horse, and Sir John follows post-haste for explanations. He gets them, and is so amused that for a while he forgets to storm and shout, and the wedding bells begin. And, voila tout. Miss Annie Hughes, as Dorothy, is delightful as ever, and her acting the perfection of comedy. With Mr. Vane Webster as Murray Vane I was not particularly struck, although the part was quite in his line. But for Mr. J. H. Barnes as Sir John there can be nothing but praise. Sound and workmanlike, it is a splendid piece of acting in a part that might so easily have been overdone. For Mr. Frank Cooper I have a great admiration, and his work in the part of the unsuccessful rival was a treat to watch. He wears his old-fashioned clothes as if he were used to them, and has the easy air of a man of position in those days. The famous blacksmith of Gretna Green was played in solid, smug style by Mr. E. H. Brewer, and the chorus—I beg its pardon, the “crowd” worked hard. Wodehouse’s account book, Money Received for Literary Work, shows that he was paid a guinea (£1·1) for this item, just half of what he received for the June 11 review which filled a page in the magazine. The account book entries are listed just as “At the Play” and further specified only by their dates. The usual guess is that Wodehouse reviewed Sergeant Brue and that H. C. Ferraby reviewed The Finishing School, and that is certainly plausible. Note the self-conscious use of “as the Americans say” soon after Wodehouse’s first trip to the USA in April–May 1904. Sergeant Brue is best remembered now as the show in which Wodehouse’s first theatrical song lyric, “Put Me in My Little Cell,” was interpolated. Most sources (Jasen, McIlvaine, McCrum) take the date of the song’s first appearance (December 10, 1904), as the opening night of the musical itself. But this review from June 1904 makes it clear that the song was a later addition to a musical comedy that had already been playing for half a year or so. A search of contemporary newspapers reveals that the opening was first announced for June 4, about a week after “A Chinese Honeymoon” closed at the same theatre, then postponed twice because of delays in getting the Strand Theatre ready (announced for June 11, eventually opening on June 14). The opening was reviewed in daily newspapers on June 15, 1904, leaving us in no doubt about the matter. 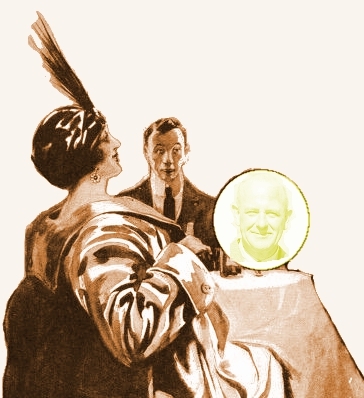 The Globe reviewer found the lyrics by Mr. Hickory Wood to be “distinctly weak”; no doubt this opinion helped induce the show’s author, Owen Hall, to ask Wodehouse to write a comic lyric to be added to the show. Wodehouse records in the account book that he saw his song sung to great audience response on Saturday and Monday, December 10 and 12, 1904, and he noted the five guineas received for the lyric on the December 1904 page of the book. as funny as Mr. Plowden: see this note by John Dawson. Miss Zena Dare: stage name of Florence Harriette Zena Dones (1887–1975), who indeed did go on to further great success in Edwardian musical comedies, working with Seymour Hicks and George Edwardes until her 1911 retirement upon marriage. Later in life she returned to acting in stage and film productions. Both of the above were mentioned in Wodehouse’s parody New Year Resolutions for 1907, and Miss Dare appeared in the 1908 edition. Thanks to Tony Ring for providing a copy of this rare item.